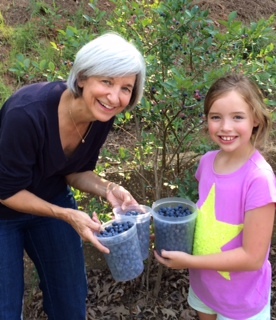 For some reason, the bushes in our neighborhood have been chock full of blueberries this year. Loaded, for weeks on end. At first there was a mad rush to fill our buckets before the neighbors picked them clean. Unfortunately we picked some before their time, SOW-ER. Then, they were beautiful and big, plump and ripe, sweet and delicious. I gathered as much as I could, blueberry season being short, you know. Then I took my granddaughter to gather with me. Then I dragged my husband along. We put handfuls of blueberries in our mouths on our cereal and atop our ice cream. I made blueberry pancakes and blueberry smoothies. I made blueberry crisp (4 times). I found a Blueberry Buckle recipe on-line which was quite good, so I made a double batch to share with my neighbors. I gave containers of berries to my friends who live in the city and froze blueberries in zip lock bags. My problem is that when I go for a walk, I pass those blessed bountiful bushes and I cannot walk on without stopping to gather. I feel personally responsible for the berries that are shriveling up on the vine, sad that I ignored them until they passed their prime. 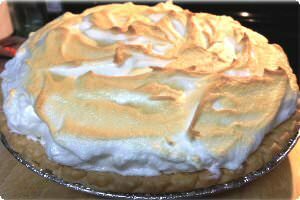 So, I’m still picking but suddenly craving my Grandmother’s lemon meringue pie. Cream butter, sugar and flour together. Add 2 whole eggs and 4 yolks (save whites and set aside). Add milk slowly, then lemon juice and grated rind. Beat eggs and salt until soft peaks form. Add cream of tartar. Add sugar gradually, 2 tbsp at a time and beat until stiff. Spread over pie and bake at 400* for 10 minutes until lightly browned. Delicious! Meanwhile: Anyone have any good blueberry recipes?